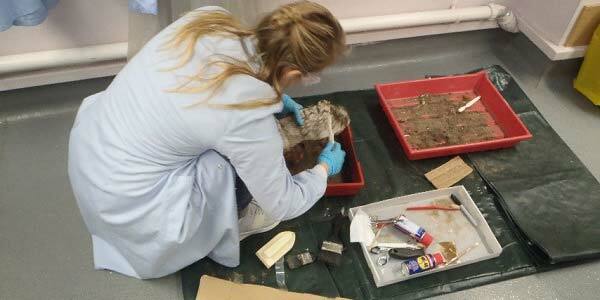 Jill is an MSc Forensic Science student at the University of Strathclyde. As part of the programme, all students take part in a Major Crime Scene exercise and Jill has provided an insight into what is involved in this part of the course. It’s the first day of a busy week, so the best way to start it is with a coffee! The perfect way to start a chilly day in Glasgow! We spent the day preparing for the upcoming Major Crime Scene Exercise, a simulated crime scene where we have to collect, process and analyse evidence. We had our first group meeting to discuss general plans for when we got to our crime scene on Tuesday and the paper work we knew we had to complete there. Then we headed into the lab to check our crime scene boxes which contained all the equipment we’d need whilst out at our scene before finally gathering a scene suit each and lots of gloves! We travelled to Stepps which isn’t too far from the University, for the first day at the crime scene. This was the outdoor part of the exercise and is definitely the most talked about and anticipated day of the whole course. It’s safe to say it didn’t disappoint! We were split up into groups and each group had a different scene that they were responsible for. They had to ensure that the scene had been secured, searched and all evidence was gathered. We were lucky to have such good weather for this exercise considering it’s the middle of November here in Scotland! We gained some invaluable learning experiences as we got to experience the processes taken in examining a crime scene but in a safe environment. It’s definitely a day my classmates and I will remember. It was a busy start to the day; we had a group recap before a briefing with the lecturers later on. The lecturers take part in the role-play part of the exercise, taking the role of the police team who are also working on the scene we are studying. Through the lecturers taking the role of the police team, this helps make the experience more realistic, and gives us a real feel of the full process that you go through when working on a case. It’s a very useful part of the exercise. 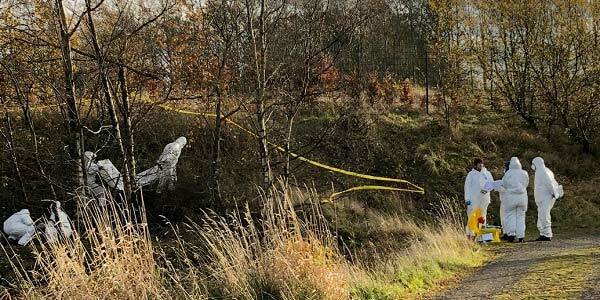 We had to provide the ‘police’ with the updates of the evidence that we found at the scene from the outdoor part of the exercise yesterday and our plans for the laboratory analysis of the exercise. Today was our first lab day! This took place in the Forensic Science Training Laboratory. We started off with a group meeting as we had our first assignment due, of course adding in some doughnuts helped keep our focus on the task at hand! We spent some time looking at all the evidence that we collected and started to think about the analysis that we should do. We had to check the clothing from our ‘victim’ for stains, fibres or any other possible marks. We also had some footwear casts that we took from the scene which had to be cleaned. The first semester of MSc Forensic Science equips us with the knowledge of new techniques that can be used in labs in both biological and chemical analysis categories. 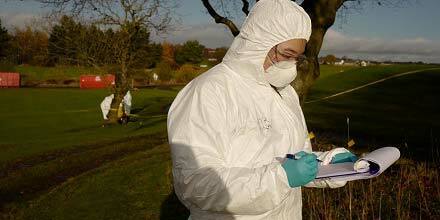 Having this knowledge really helps in becoming a well-rounded forensic scientist. One of the tests we carried out on the evidence was to see if blood was present. We used dry-filter paper and rubbed this on the clothing, we then added the Kastle-Meyer presumptive test reagent and hydrogen peroxide to the filter paper. If a pink colour showed then it is highly probable that the stain is blood, which is of course what we discovered! We will need to run more tests to confirm. Lab work continued for a second day and we continued with our analysis of the evidence that we collected at the crime scene. There was some new clothing and shoes that had to be tested, this came from our two suspects! We could compare this with what we had already collected. There were also swabs that were taken from our victim which were analysed. The class was split into biologists and chemists, giving us a wide range of specialist skills in the class. As we had a wide range of evidence, having the specialist skills meant that everyone had something to analyse. The Major Crime Scene Exercise Week was a busy week with lots of work to be done but it was such an enjoyable week. I was lucky to be a part of a great group and we had lots of laughs along the way which made the hard work all the more enjoyable. The exercise is a great way to put into practice all the theory we’ve been learning over the semester and see it all come into practice. My favourite part of the week was definitely the outdoor crime scene part of the exercise!